AleaSoft, November 29, 2018. The fall in the price of European coal and Brent oil has been unstoppable since October. This week, coal managed to stop the fall and recovered slightly. Brent oil showed signs of a slight recovery at the beginning of the week, but the increase of production outweighed the weakened bullish sentiment and today the price continues to fall. The price of European API2 coal has stabilized and the future product for January raised 1.4% this week after four consecutive weeks of bearish trend. 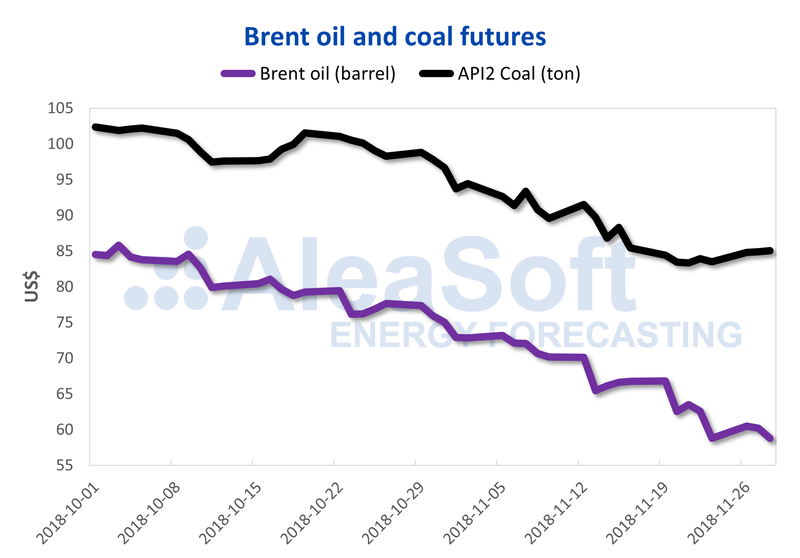 This slowdown in the fall of the price of coal is related to the slowdown in the fall of the price of Brent oil and the rise of the price of gas, but has a weak sustenance in terms of the balance between supply and demand, according to AleaSoft. On Friday, November 23, the price of the future of the barrel of Brent oil for January fell below $60 a barrel and reached its annual minimum. This week so far, the price remained above $60 on Monday and Tuesday, despite rumours of increasing production. The fall of yesterday, November 28, down to $58.76 indicates that the upturn was an adjustment after the fall of 6.1% last Friday, November 23. For its part, the price of TTF gas is at the same level of last week with a slight increase of 0.7% with respect to the previous week. 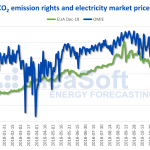 The price of CO2 emission rights fell 2.1% this week compared to last week, but remains stable between 19 € and 21 € per ton, for the third consecutive week. Source: Prepared by AleaSoft with data from ICE and EEX. 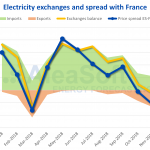 The prices of electricity futures for December in European markets fell this week due to the revision of weather forecasts that point to a mild winter in terms of temperatures. OMIP futures for Spain and Portugal for December fell this week by 2.2%. The future for France fell by 5.1%, and that of Germany, by 3.0%. 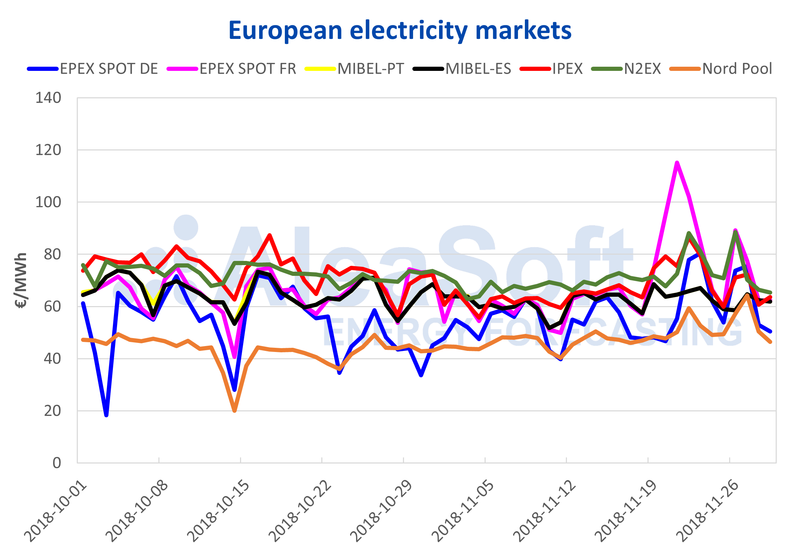 After the price peaks recorded in several European electricity spot markets during the last week and the beginning of this one, and from which the Iberian market MIBEL managed to stay away, prices converged again just above 60 €/MWh. The exceptions were Germany and the Nord Pool, which thanks to wind production remained at 50 €/MWh. Even so, this week, the price of the Nord Pool, traditionally the lowest in the continent, registered a price of 64.29 €/MWh for Tuesday, November 27, its second most expensive price of the year. Sources: Prepared by AleaSoft using data from OMIE, EPEX SPOT, N2EX, IPEX and Nord Pool. Temperatures continue to fall, although they remain at typical values for this time of year. This week of November 26, AleaSoft forecasts an increase in electricity demand of 1.9%. For next week of December 3, AleaSoft forecast indicate an average increase in temperatures of 1.6°C in the peninsula and a decrease in demand of 0.7%, once the effect of the festivities of December 6 and 8 was corrected. The level of water reserves in hydroelectric dams has already started to rise after its seasonal fall during the summer. According to data from the Ministry for the Ecological Transition, after the minimum annual level at the end of October, the level of reserves increased by 2.1% and they stand at 59.3% of its total capacity, slightly below the average of the last 10 years.